Obv: Peter I on horseback riding over field of dead soldiers. HIC HONOR IN. NOBIS INVIDIOSVS ERIT. OVID (We Shall Be Envied for this Glory). Rev: Hercules with club, trophies below and topographical plan of Poltava in the background. POLTAVA MIRA CLADE INSIGNIS (Chronogram of 1709) (Poltava Is to Be Glorified for the Wonderful Victory). Exergue: VNIVERSO SVECORVM EXCERCITV DELETO (All the Swedish Army Is Destroyed) D. 27. IVN. 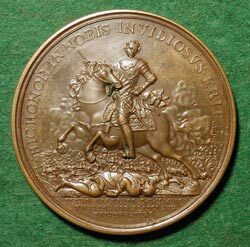 S. V.
This medal is similar to that struck by P. H. Muller in 1709, the year in which the Battle of Poltava was fought. The piece shown was likely issued around 1770. The obverse is by Judin and the reverse by Jaeger. Durand observes that Judin's medal of the Battle of Poltava has placed him in the front rank of medallists (Forrer). 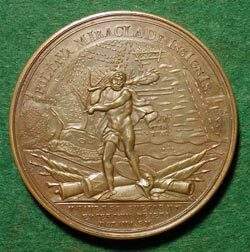 The medal commemorates Russia's victory against Charles XII of Sweden in the Great Northern War (1700-1721), a war in which Sweden was opposed by a coalition of forces, including Denmark, Saxony, Poland and Russia. Sweden had enjoyed several victories and had crushed the army of Peter the Great in 1700 at the Battle of Narva. In 1708 Charles XII renewed his assault on Russia but made the strategic mistake of advancing through Poland to the south of Russia, instead of attacking straight against Moscow. Although some of the Cossacks joined him, Charles had an insufficient force and was depleted by a severe winter. This combination of factors led to his decisive defeat by Peter the Great near Poltava, a town in the Ukraine, in 1709.